IC design validation is critical to the success of today’s semiconductor manufacturing process. In addition to electronic design automation (EDA) design verification tools, built-in-self-test (BIST) and design-for-test (DFT) methods, IC manufacturers are using a variety of methods to validate first silicon examples. This includes testing with engineering probe systems by using variety of instrumentation, automated test equipment (ATE) and dedicated engineering validation systems. 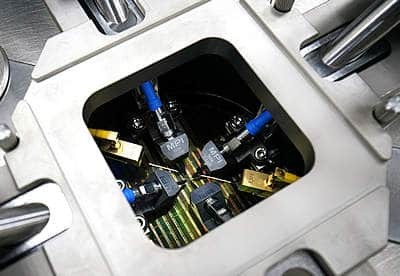 When doing measurements for IC engineering and design validation, engineers are challenged by the need for system configuration changes of test instrumentation such as DC and RF power sources and meters, oscilloscopes, and/or VNAs. Compounding the issue is measurement over temperature, high-impedance, frequency ranges and driving the IC with high pin-count probe cards. Cable interface to ATE is very common too. MPI’s complete solutions for RF Probes ICs provide the perfect environment for precision RF measurements and calibrations up to 110 GHz by employing MPI’s calibration software QAlibria® and MPI RF and Microwave probes. Dual TITAN™ probes with GSGSG and GSSG is the ideal choice for the measurement mmW differential ICs. MPI also offers broadband active probes with replaceable probe tips and high input impedance for precise oscilloscope measurements.